Bible searching with SwordSearcher is easy, instantaneous, powerful, and yields relevant results for positive impact on your Bible study. Watch a video demonstrating simple Bible searching. 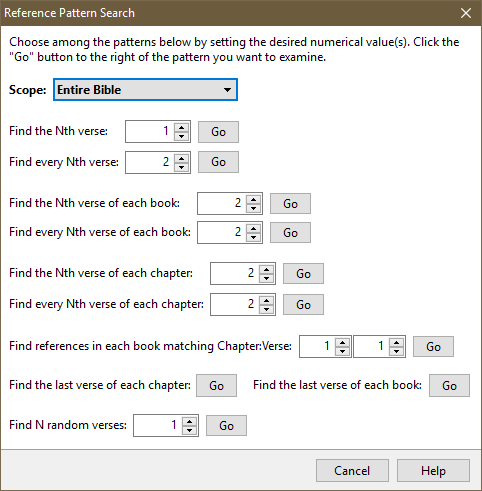 Searching the Bible for words or phrases just doesn't get any faster, or easier, than this. SwordSearcher's search box is always right at the top of the screen, ready to help you dig into God's word at a moment's notice. All the verses are shown with full text in a Verse List. Need help with spelling? No problem, the search box will automatically suggest spelling corrections as you type. Trying to remember a phrase? That's easily done with SwordSearcher, because the search box will offer phrase suggestions as you type, too! Find words even when you don't know how they are spelled. Not sure how to spell Methuselah? Searching for "savior" when the KJV has "saviour?" No problem! 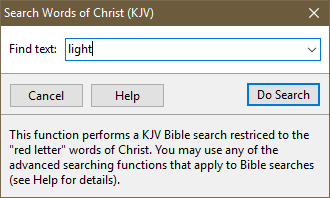 The Search box will automatically suggest spelling corrections and the Word List lets you select Bible words even when you are not sure of the proper spelling. More power when you want it. Find all word forms— search for "love" and find "loving, loveth, lovest," etc. Select words from a complete word list of the Bible. Special groups of books: The Law, History, Major Prophets, Books of Moses, Pauline Epistles, General Epistles, etc. Define your own custom search ranges! Find words near each other. You're sure you've seen two words near each other in your printed Bible. But you can't remember where! Just use SwordSearcher's Proximity Search. 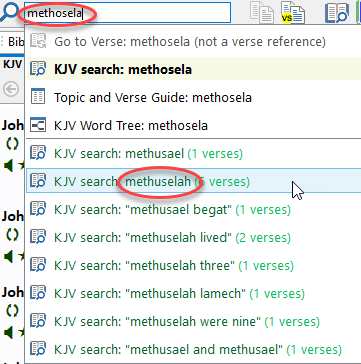 Search "within X verses" or "within X verses of the same chapter"
Use the Search Words of Christ option for fast "red letter" searches. This can be combined with other more extensive options if you really need to get detailed. 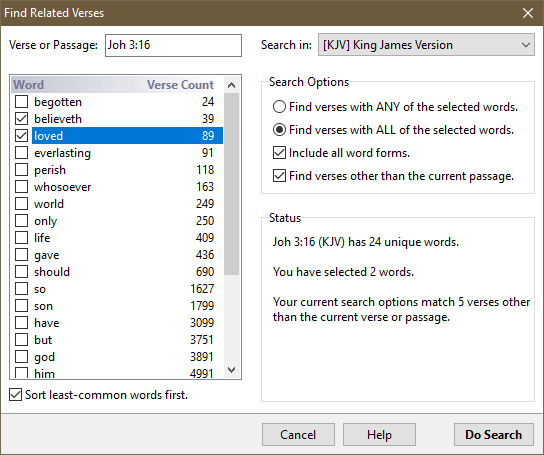 The Find Related Verses search window makes it snap to see how words, or groups of words, are used elsewhere in Scripture. Combined with the ability to search all word forms, you'll discover wonderful parallels in your own study and let the Bible interpret itself for you. Want to try some really unique searching? What's the 1000th verse of the Bible? Of the New Testament? Old Testament? Paul's Books? Want to see every "3:16" verse in the Bible? All of the above is easy with SwordSearcher's Reference Pattern Search tool. The King James Version with Strong's Links lets you search for Strong's Numbers. 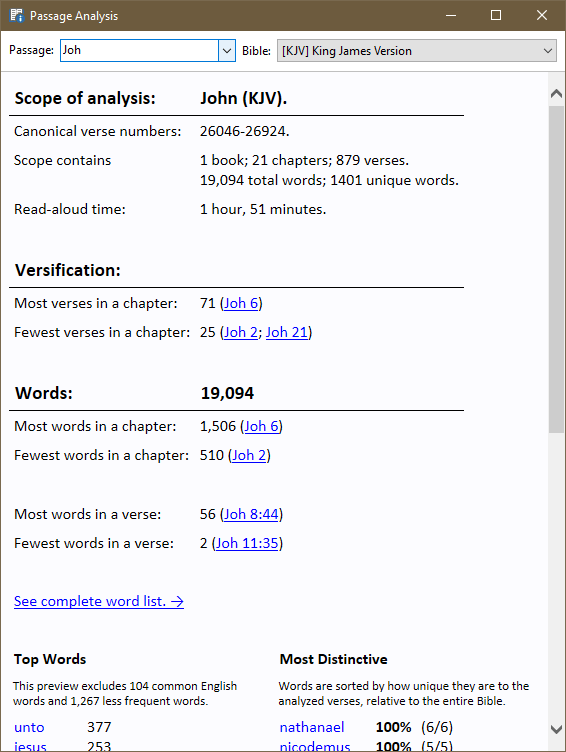 You can also search the KJV for Strong's numbers and see the English text highlighted for the Strong's number (see example at right). You can also use the English-Strong's Indexer to do a "reverse" Strong's number search and see which Strong's numbers are associated with a given English word, like a Young's Concordance. Number of books, chapters, and verses. Time required to read aloud. 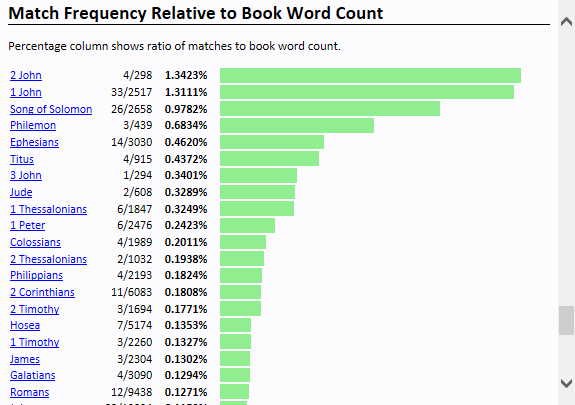 Top word lists with counts, excluding common English words. Complete word list, sorted alphabetically or by frequency. "Distinctive" word list, listing words by how unique they are to the selected Scripture portion(s). This is an easy way to search for specific punctuation. Want to see every question mark in the Bible, or the word "me" only when it is followed by a question mark? Use the Character String Search. The Bible Word Clouds Generator helps you "see" how words relate to each other. 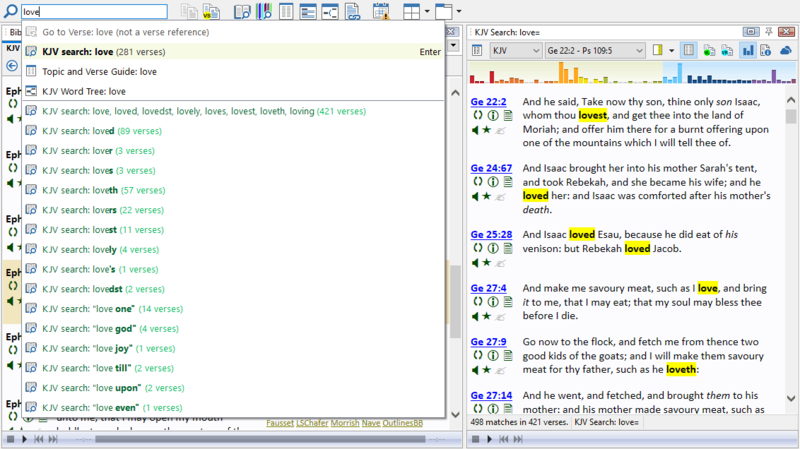 You can build a word cloud with one click in the Bible panel. But even better, you can build a word cloud from your search results to see what other words frequently appear next to the one you are studying. And then there's the Word Tree tool. Explore fascinating connections and patterns from words and phrases. 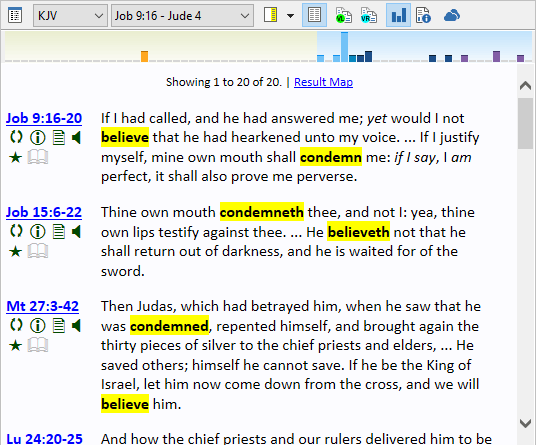 Search commentaries and books by verse reference, instantly. For power users: need to search for a list of words, but make sure only one of them is matched by case, and another is matched "fuzzy?" 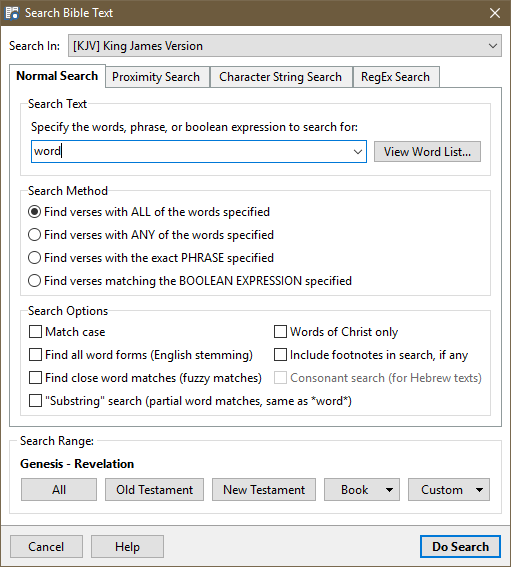 SwordSearcher's Advanced Search Expressions are there for you, and are even supported in the Quick Bible Search box and proximity searches. Power users see all the details here. Search the whole library, too! There's no question about it: Bible study is about studying the Bible, so SwordSearcher is all about Bible search. But it doesn't stop there: You can also search the entire set of commentaries and books, including your own that you make, in just a few seconds. Most of the search functions described above apply to Library searches, too! 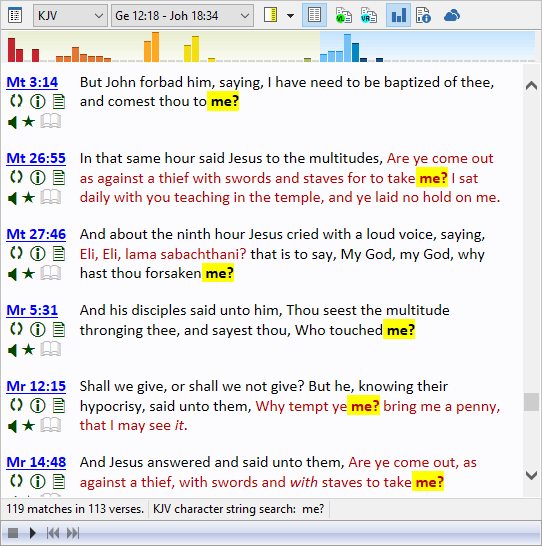 SwordSearcher is the most powerful Bible search tool available. Get it now! Money-back guarantee. Acts 17:11 ...they received the word with all readiness of mind, and searched the scriptures daily, whether those things were so.